Luxurious sousde in two unique tiers is the highlight of this scrumptious gusseted gypsy skirt! It's an A-line cut -- wide around the hips -- with a long and low top tier that comes to figure-flattering points. 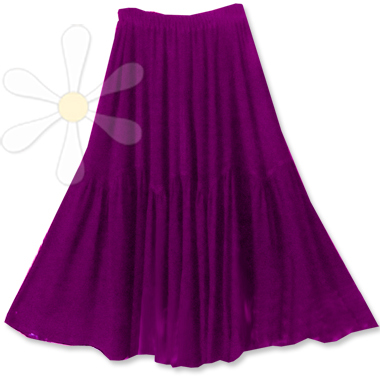 The durable, handmade quality of this free size skirt is nothing short of exquisite, down to the fine French-finished seams. Treat yourself to something especially wild and fun... express your inner goddess every day! MORE VIEWS OF JUNILLA GUSSET SKIRT NEW!